The furniture refinishing continues around here! 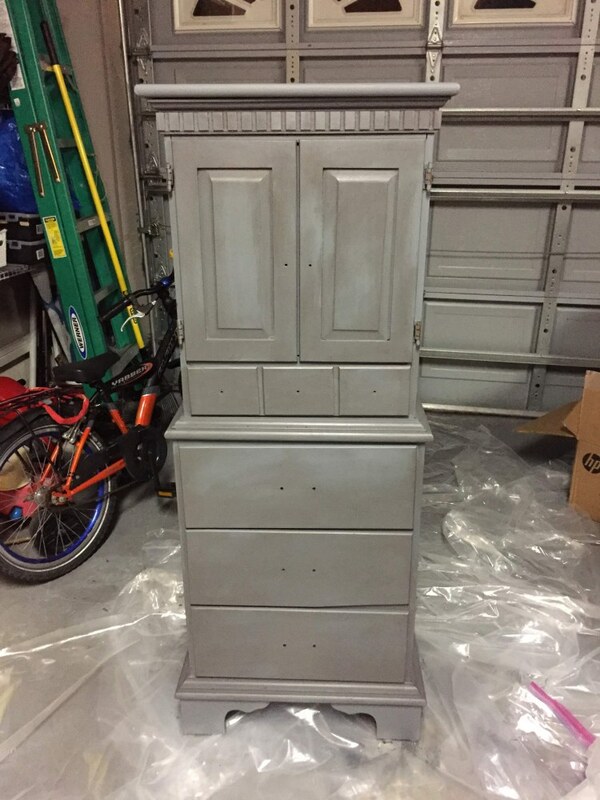 This week I took on a tall chest of drawers that I remember in my childhood being in my Dad’s closet. Sometime in High School my parents updated their furniture and this piece made its way into my room. Well, a few weeks ago I removed it from my parents’ house and put it in my garage to get a new life in my new house. We needed something near our front door to capture all those little things that we like to keep by the door. We like to keep headphones here, for when you are dashing out the door to go to the gym. We also really like to keep umbrellas near the door and all our tickets! One of these drawers also typically serves as the junk drawer. 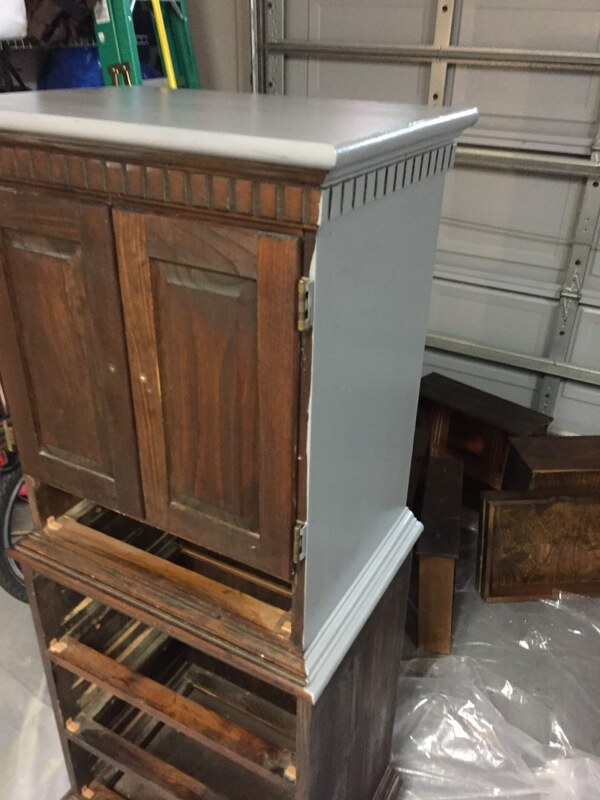 We had used a larger cabinet in other houses but it didn’t fit here and it was, like so much of our stuff, destroyed in the move. Turns out though this little cabinet is the perfect fit for this lovely space. (Although, looking at this picture makes me realize how much I need to find a new light for this entrance!) I digress. My friend and fellow writer Amber from Poole It Together recommended Fusion Mineral Paint. 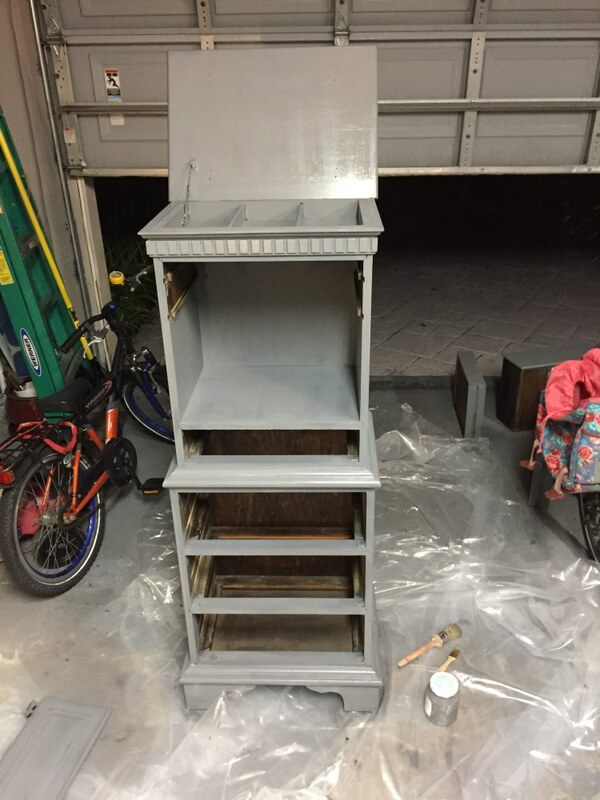 I used Fusion Mineral Paint to do our bedside tables and was ready to give it a try on something more challenging. Before starting I removed the doors and all the hardware. The darker color was so much easier to cover this dark wood than the white paint I used on previous projects! Although this piece was larger it was so much easier to do! 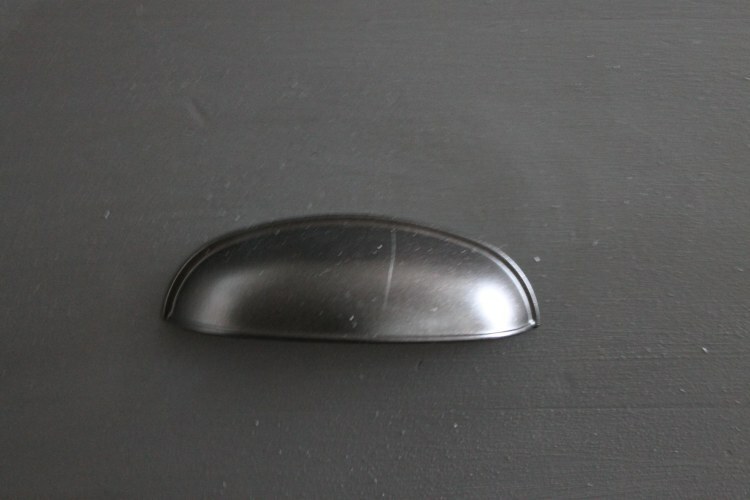 It only took two coats to reach the desired color. Once it was dry I busted out the Fusion Mineral Espresso Wax to give the piece a worn look. I was so so nervous. I texted Amber a million times because I was too scared to start. Then I just went for it. I applied it with a small round wax brush directly from the jar. I worked it around until I had my desired result. Applying the wax is best done in good light, but when you have three kids sometimes the only time to work on projects is at night. 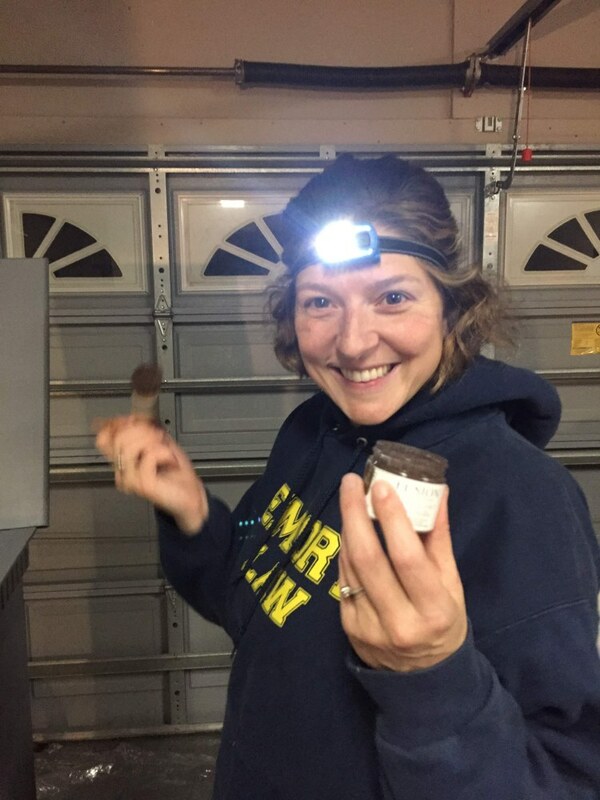 I donned this amazing headlamp to help me see what I was doing! As usual, I couldn’t quite figure out what sort of drawer pulls I wanted. Amber suggested I look at oiled brass options (seriously she is great at this stuff so go check out her blog now!). Sure enough I found some pulls and knobs that I loved. The color was a perfect fit for the piece. I hope this picture encourages you to look beyond the finish of a furniture piece. Now, more than ever I think it’s about finding a great piece of furniture that has the right shape and feel. 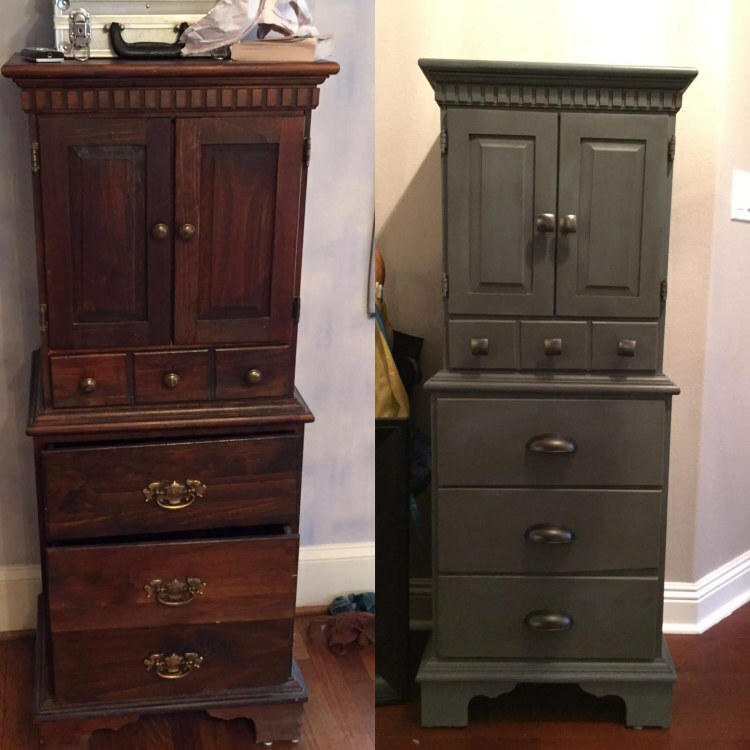 A coat of paint and some new hardware can make a world of difference.